• teach children the basics of the body’s “security system”: alert, alarm, assessment, and all clear. With this insightful resource of easy-to-implement solutions and strategies, you and your child can experience the opposite of worry, anxiety, and fear and embrace connection, trust, and joy. “If you want to understand your child’s anxiety—and your own parental worries—you must read Larry Cohen’s brilliant book, The Opposite of Worry. Dr. Cohen is one of the most imaginative and thoughtful psychologists you will ever encounter. He explains how and why children become anxious and then shows how we can use empathy and play to help them escape from the terrifying dark corners of childhood.”—Michael Thompson, Ph.D.
Lawrence J. Cohen, Ph.D., is a clinical psychologist specializing in children’s play, play therapy, and parenting. He is the author of Playful Parenting and co-author, with Michael Thompson, Ph.D., and Catherine O’Neill Grace, of Best Friends, Worst Enemies and Mom, They’re Teasing Me. Dr. Cohen leads Playful Parenting workshops for parents, teachers, and child-care professionals. He lives in Boston, Massachusetts, with his wife, Liz. They have two grown children. 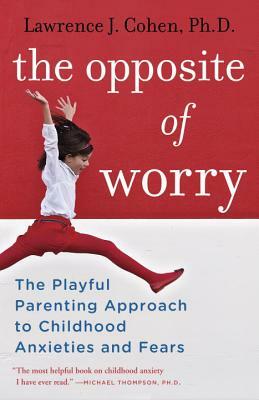 “If you want to understand your child’s anxiety—and your own parental worries—you must read Larry Cohen’s brilliant book, The Opposite of Worry. Dr. Cohen is one of the most imaginative and thoughtful psychologists you will ever encounter. He explains how and why children become anxious and then shows how we can use empathy and play to help them escape from the terrifying dark corners of childhood. This is the most helpful book on childhood anxiety I have ever read.”—Michael Thompson, Ph.D.